Ninth Bible printed in High German. With: Thomas Aquinas, Summa contra gentiles. [Strasbourg, not after 1474]. First edition. 2 volumes, 382 x 260 mm and 383 x 250 mm. – I (Bible): 584 leaves. Initials supplied in red and blue, 109 woodcuts, all in bright original colouring. II (Summa): 248 leaves (bound with the second volume of I). I. The first Bible printed in German appeared as early as 1466. The present edition is usually called the 'ninth German Bible'; the 'eleventh', however, would be more correct, if one includes the Low German Cologne Bibles in the chronological sequence of German bibles. Koberger's edition is regarded as typographically the finest, and is without doubt the best-known and the most influential of the German Bibles before Martin Luther. 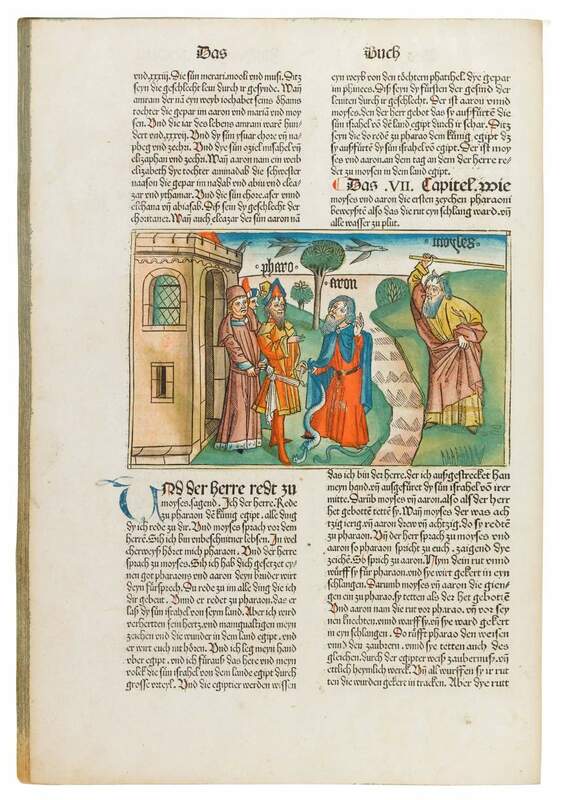 For the illustration of this Bible, Koberger used the series of 108 large woodblocks published before in the two Low German Bibles printed in Cologne in 1478-1479. II. The Summa contra gentiles is one of Thomas Aquinas's most important works, in which he showed that Christian theology is the crown of all science and established the relations between theology and philosophy.